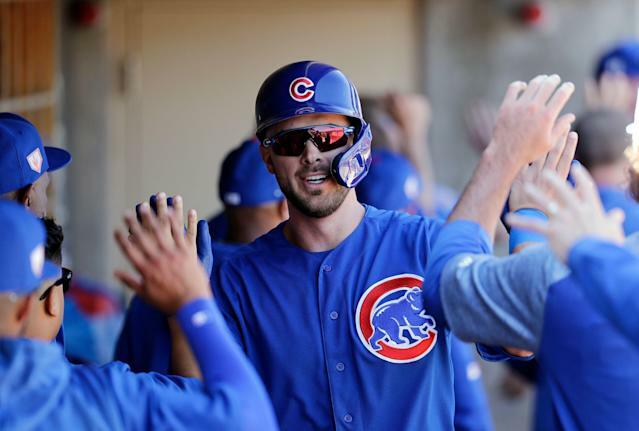 Kris Bryant is one of Scott Pianowski's common-thread players for 2019. How many leagues am I in? Too many to count. Common threads emerge, and some players are more important to me than others. Here is my Wallet for 2019 — the key players who will largely shape my season, for good or for bad. We’ve already seen his upside: It’s NL MVP. The RBI count two years ago was a fluke, and last year’s nightmare is easily explained by injury. He’s healthy now, and into an age-27 season. Bryant has slipped into the third round often this year, and that’s just about an auto-pick for me. No, he’s not inexpensive. But I have no problem with him in your first round. Keep in mind deGrom is a converted pitcher, so he doesn’t have all the back mileage and scar tissue. Citi Field is a favorable spot, and it was death valley last year. The team around him is presumably improved. And when you watch deGrom, you have baseball’s best TV booth steering you along. Appointment viewing. No one saw 2017 coming, so the Regression Police laid into Gennett last year. Oops, he did it again. Because Gennett surprised the industry — because no one is personally invested in his success — the pundits are reluctant to step on board. Cincinnati’s upgraded the lineup, too. While the RP has reluctantly bought into Whit Merrifield, Gennett remains a value pick. Last year is the floor, and it’s worth a fifth or sixth-round pick. And the upside is a Cy Young run. Minnesota is set up in a cushy division (the only presumed contender, Cleveland, has a middling lineup), and if you run matchup strength based on over/unders of common opponents, the AL Central turns into one fluffy pillow. I’ll also sign off on Kyle Gibson and Michael Pineda at their current tickets. The projection systems spit on him because of the awful numbers in Texas, but throw those out. It’s an unfair park for a pitcher, and eventually it seeps into a pitcher’s head, gets them into bad habits. Hamels was lights out in his Chicago time, and while those ratios are not the place to bet, he’s a safe play for a plus ERA and WHIP tied to a winning team. The expected innings are a value, too, especially in the context of 2019. Jersey Salfino thinks I’m crazy for this one, thinks Villar is a bad baseball player who could easily lose his job. I say, on the Orioles, will anyone even notice? And I don’t need Villar to shepherd a real-life baseball club, I’m just in it for the numbers. Villar has been all over the map for three years — one outstanding year, one playable one, one mediocre one. But even the bad one gave us 11 homers and 23 steals; that’s the floor. And heck, he was a stud in his 54 Baltimore games (eight homers, 21 steals). A fifth or sixth round pick sounds perfectly reasonable to me — we have to mind the gap between real-life and fantasy value. Is this cheating, listing them both? Maybe. But someone is going to be the second baseman here, and maybe they both find a way into the lineup. Colorado is the simplest cheat code of them all. And it’s not like Hampson and McMahon are banjo hitters — I’d like them in a neutral park environment. They can be needle-movers in the thin air play-land. I guess this is the Ibanez All-Star run for Molina. Part of fantasy catcher value these days is just showing up — not that many guys can even get to 400 at-bats. And even if Molina is trading more on experience than athletic ability these days, note the 38 home runs over the last two years. He’ll steal a handful of bases, too. Somehow, my Tout Wars friends let me have him for $6 in the 15-team mixer, a league that starts 30 catchers. In a full season, 15-15 seems like a lock and 20-20 perfectly within the range of outcomes. I think the Pirates are going to regret this Chris Archer deal — Archer is one of those guys who looks a lot better far away than up close. Meadows was a Top 10 prospect two years ago and he’s stepping into an age-24 season. Tampa Bay commonly guesses right on this type of player. The Pirates are so darn boring these days, I don’t blame anyone who doesn’t want to audit the lineup. Frazier is probably going to bat leadoff, and so long as he hits well enough to keep the gig — he certainly should — 18-20 home runs are in play, with a solid average. You can slot him at second or in the outfield. Every team is worth our attention. Once highly touted, he’s stepped into the boring, nondescript part of his career. I get it, too many ground balls. But Mazara’s ADP merely asks him to maintain his established level of production — what if something clicks in his age-24 season? You need to have a few guys in this lineup, for the park alone. Enjoy the Rangers while they’re still outside. Very similar to the Frazier case, a multi-position guy on a team no one wants to think about for five seconds. Anderson is a little more proven, too. There are fleas — the power is mediocre, the park and team a drain. But Anderson will give you volume, he’s assured of a good lineup spot, and he’s almost free. My guess for this year’s Treinen, the second-tier closer who could graduate to the first tier. San Diego didn’t consider anyone else for the ninth after the Brad Hand deal, and the park, while not as run suppressing as in the past, will help keep the scores in save range. He hit for a plus average last year and showed power, but now he’s a super-utility man. That can be spun as a gift and a curse, but if almost anyone in the regular lineup gets hurt or slumps, Camargo slides into an easy 500-plus at-bats. The perfect guy for the mixed-league bench. No, I don’t like the lineup slot. But the glove marks his job — especially on this team — and the category juice plays. And there’s no guarantee Bader has to bat in the lower third all year. I wouldn’t necessarily pay an expectant price omniscience’s for Bader, but the market won’t force you to. As the great Gene McCaffrey would tell you, fly ball pitchers aren’t so bad. Boyd’s WHIP will play, and his strikeout rate is close to being useful. Maybe I need a touch more improvement for Boyd to actually help me, but I’m getting him at a price where it’s all upside. The hidden little secret about the middle infield is that it’s deeper on the back end than commonly realized. Semien will probably tax your average, but that career .249 mark isn’t a kill shot in today’s game. He’s had double-double category juice for four years running, even in the year he played 85 games. Unsexy, boring value picks are my jam, and Semien qualifies.